Robert Hill was a member of the Australian Senate from 1981 to 2006, representing South Australia. He was educated at the University of Adelaide and the London School of Economics, where he gained a masters degree in law. Hill was Leader of the Government in the Senate from March 1996 until his resignation in January 2006. He was Minister for the Environment 1996-98, Minister for the Environment and Heritage 1998-2001 and Minister for Defence from November 2001 to January 2006. In July 2005 the Coalition parties took control of the Senate and Hill became the first Government Leader in the Senate since 1981 to command a majority in the chamber. In January 2006 he announced his resignation from the Parliament. Hill was Australian Ambassador to the United Nations for Australia from 2006 - 2009. 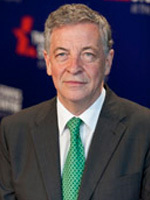 In July 2009, Hill was appointed by Prime Minister Kevin Rudd as Chairman of the Australian Carbon Trust. In June 2012, he was awarded a Companion of the Order of Australia.